Tarascos’s Mexican Restaurant – Tarasco’s goal is to provide the best quality homestyle meals, served in a warm and friendly atmosphere at prices you can easily afford. Stop by and try some of their homemade favorites and relax in this family friendly environment. Taqueria Guacamaya- Just across the river this little Taqueria is perfect for a grab and go burrito, for a day on the river! Grab some chips and guacamole and enjoy a little Southern Oregon sunshine under the bridge. Rogue Burrito- Specializing in made to order burritos, tacos and chimichangas, Rogue Burrito is also great in catering to those with other dietary preferences. Serving tofu and burrito bowls, this stop makes it easy to feed everyone. 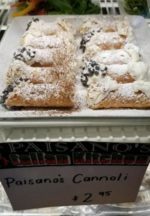 Paisanos Italian- Top-rated pasta, rich sauces, and more great Italian fare await your palate at Paisano’s Italian Kitchen in Rogue River. This restaurant is kid-friendly, so little ones are welcome to tag along. Warm weather, delectable dishes, and an awesome atmosphere make for a dream night out at Paisano’s Italian Kitchen. Friendly pooches can come on in at Paisano’s Italian Kitchen, which welcomes dogs as well as their owners. Baci Pizza – More than just pizza! Serving hot sandwiches. lasagna, calzones and many other favorites, this traditional pizzeria offers games in the back for the kiddos and a big screen for the sports fans! The pizza bread lunch special is a great option for those with limited time and a large appetite. Abby’s Legendary Pizza -Known around the Pacific Northwest, Abby’s legendary is just that. With many different pizza styles and toppings Abby’s delivers consistent fan favorites. With items like Taco Pizza, Fajita pizza and in some locations even Polish hot sandwiches, there’s a little bit of everything. BeeGees Diner -This classic diner provides Breakfast, Lunch and Dinner. Known for their pies and giant cinnamon rolls, BeeGee’s is a great spot for traditional American food. Subway -Classic chain Subway is the only fast food place in Rogue River. 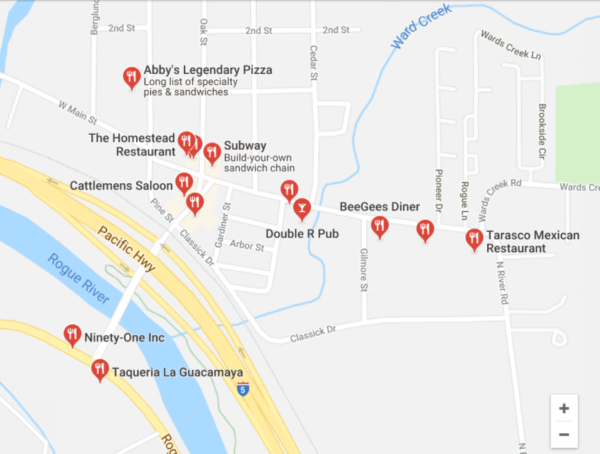 For quick, healthier option eats this location is right in the middle of town on Main St.
Depot Street Grill – Known for the “best hamburgers on the I-5″ Depot Street serves traditional hamburgers, shakes and local Umpqua Ice Cream by the scoop. 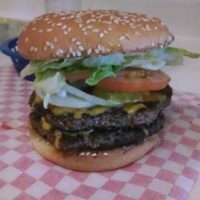 Make sure to have time to wait, these burgers are homemade and will take time to actually cook. Nothing freeze dried here! Cottage Cafe & Grill – American Restaurant and coffee shop, this cute little stop has lovely outdoor seating with tasty soups and sandwiches. Homestead Pub & Grill- Known as a local watering hole, the Homestead Bar & Grill has revamped their menus and atmosphere. Now featuring Belgium Waffles and Bloody Mary’s, the Homestead has become a great place for weekend Breakfast. The Homestead Lounge offers friendly service and outstanding entertainment. Wed. Open Mic Jam Night 8-11 Thur. Karaoke 7-11 Fri. Live Band Every Weekend 9-1 Sat. Live Band Every Weekend 9-1. Cattlemen’s- Another over 21 favorite, Cattlemen’s is known for it’s Bloody Mary’s and saloon style atmosphere. Centrally located on the main street and open from 11am-2am 7 days a week, Cattlemen’s is a Rogue River nightlife hub. Double R Pub- Your typical bar but the bartenders make it all worth it!! The bar food is better than most especially on Taco Tuesday and once a month they do a great BBQ. Open from 9am-9pm.